Molson is synonymous with Canada: hockey, beer, and bacon. Anybody remember Bob and Doug McKenzie? Our beer-swilling dimwits, wearing winter clothing and tuques, would comment on life in the Great White North while punctuating their dialogue with "eh?" and calling each other "hosers". Ah yes, that's Canada for ya. Back, way back before McCain commandeered Joe the Plumber for the GOP's unsuccessful run at the White House in 2008, there was Joe the Canadian. This was part of an ad campaign of Molson when they promoted their beer under the slogan "I am Canadian." Rah rah sis boom bah. "I'm not a lumberjack or a fur trader. I don't live in an igloo or eat blubber or own a dog sled. And I don't know Jimmy, Sally or Suzy from Canada, although I'm certain they're really, really nice. I have a prime minister, not a president. I speak English and French, not American. And I pronounce it about, not aboot. I can proudly sew my country's flag on my backpack. I believe in peacekeeping, not policing. Diversity, not assimilation. And that the beaver is a truly proud and noble animal. A toque is a hat, a chesterfield is a couch. And it is pronounced zed, not zee, zed. Canada is the second largest landmass, the first nation of hockey and the best part of North America. My name is Joe, and I am Canadian!" On February 3, 2013, Molson posted its newest advertisement on YouTube and as of this writing; it has had over a million hits. I think that constitutes "going viral". This time around, instead of one Canadian talking us up, we have loveable Canadians all over the globe showing people what a great country Canada is and what a great people those Canucks are. It's all in good fun. It's a warm fuzzy about Canada and heck, if it gets you to drink a Molson beer, so much the better. Here I am posting video ads for Molson. Is the company going to send me a free case of beer? Woo-hoo! Here's one hoser who won't refuse, eh? 24 bottles in a case; 24 hours in a day. Coincidence? I think not. Ha ha. So let's clink bottles and say, "Cheers! À ta santé!" Molson-Coors Canada Inc. is the Canadian division of the world's seventh-largest brewing company, the Molson Coors Brewing Company. It is the second oldest company in Canada after the Hudson's Bay Company. Molson's first brewery was located on the St. Lawrence River in Montreal where the Molson family continues to maintain its headquarters today. Bob and Doug McKenzie are a pair of fictional Canadian brothers who hosted "Great White North", a sketch which was introduced on SCTV for the show's third season when it moved to CBC Television in 1980. Bob is played by Rick Moranis and Doug is played by Dave Thomas. Although created originally merely as filler to both satisfy and mock network Canadian content demands, the duo became a pop culture phenomenon in both the United States and Canada. 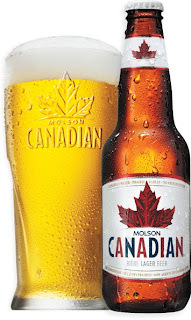 I am Canadian was the slogan of Molson Canadian Beer from 1994 until 1998 (via ad agency Maclaren Lintas and then MacLaren McCann), and between 2000 and 2005 (Bensimon Byrne). It was also the subject of an extremely popular ad campaign centred on Canadian nationalism, the most famous examples of which are "The Rant" and "The Anthem". The ads aired in both English Canada and the United States. In 2005, shortly after Molson's merger with American brewer Coors, Molson announced that it was retiring the "I am Canadian" slogan. A few years ago, a friend made an interesting comment by saying that we were both lucky simply because we were born in Canada. He was stating that for no other reason being born in this country represented a stroke of good fortune. Canada as opposed to many other countries in the world gave all of us an upper hand by statistically giving us more choices and better chances than elsewhere.